There is a stamina gene? Yes, evidently there is. This discovery explains a lot. It takes me a while to connect the dots, but now I see the fact of a stamina gene may explain why racers can be blistering fast, such as Hamburg (see speed gene) and a great stayer as well. This gene could partially explain Secretariat's ability to win at all distances. The information on the speed gene has been out there for a while, and the published explanations of the speed gene and its attributes didn't satisfy me. It wasn't the fact of the gene itself, it was the claims made for it. A genetic test was developed for the public so they could determine if their horse carries the gene, and the promotion for this test was that it would determine what race distance a horse could excel at. I realize that it is important to generate revenue in order to progress their work, but in many of these cases I have discovered that the proclamations are too hasty, and often they overreach in their zeal to promote their discovery (see speed gene and gait keeper gene discussions) and to monetize their work. While working on my recent soundness and durability study (click on 'soundness' tab at left of page to access), when I got to the Thoroughbred section I visited a few new DNA studies. One of those was the 2018 work by Dr. Daniel Polaski and his team: "Detection and Analysis of Polymorphism in the Promate Region of Equine PPARGCIA gene". In the report they state the 'stamina' gene is probably responsible for the ability to race for long distances, among other athletic feats. Like the work on the speed gene, this one variant is present in the horses in three ways: CC is not present, CG is one copy of it, and GG is two copies. The homozygous GG variant was found only in three breeds they tested: the Heavy Polish Draft, the Arabian and the Standardbred. In the Thoroughbred they used two test groups: a elite winners group and a non-elite group to see if it affected performance. The elite group was most often CG, and the non-elite group was usually CC. As was done in the speed gene, this team promoted their genetic test as a way to determine racing ability. They added that they did not test horses that raced over 2 miles nor steeplechasers, and surmised that group might well carry a GG variant. From my own historical and pedigree research over the decades I came to understand our racers of the 1800s had reached a pinnacle in stamina and speed that has never been duplicated. Today when we see a horse like Secretariat win the Triple Crown with a 31 length lead in the Belmont we swoon. Yet, I knew that our racers of the 1800s, both gallopers and mid-gait racers, performed far beyond the magnificent Secretariat on a regular basis, and that the stamina he displayed was but a shadow of what was commonplace then (see Legacy of Lexington for the full story or Real Stayers for a short example). According to the speed gene literature, you can determine your horse would make a good stayer by its lack of the speed gene (TT). This position did not sit right with me. I knew that many of the great stayers of yesteryear were fast as well as long runners, some could win sprints as definitively as the grueling heat races, a good example is Monsour Tonson RH, or Barleysides RH. And truly any fool knows that to win a race you must be faster than the others, speed is a necessity to win. 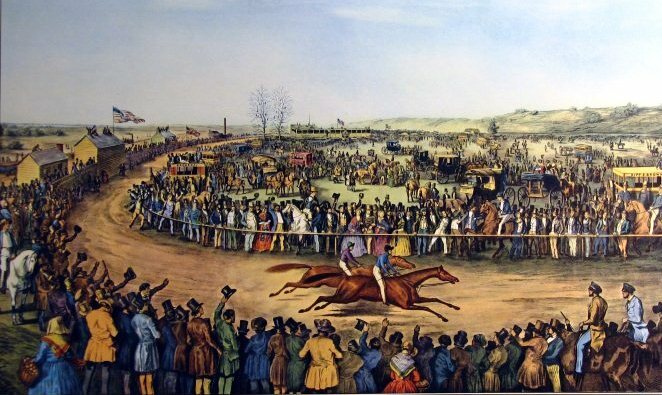 Here are a few quick examples of tremendous racers and sires from that era to illustrate the point: One of the surefire speed sources of the 1800s was the premier Blackburns Whip RH. An extraordinary horse, he was primarily a pacer, but could also race at the trot and gallop, he was clearly and cleanly 5-gaited, and he possessed tremendous speed along with stamina. He could win at any gait at any distance, everything from sprints to 4-mile heat races. And he became such a stellar bloodline for speed that he is found in the Thoroughbred, Standardbred and Quarter Horse. The great Lexington RH held the world record for 4-mile heat racing and his trainer said that he was unbeatable at any distance from a half mile to the 4 miles or beyond. The great breeder John Randolph reported that our native 'quarter horses' were far better then the imported English Thoroughbreds in 1832 because they could not be beaten in quarter mile sprints, nor in any distance races of twenty and even fifty miles. He said the only race category that the newer classic version of the English Thoroughbred (as opposed to their much sounder and stronger heat racer of the 1700s) could win against them was in a race of 1 or possibly 2 miles. Further, the greatest speed line of America was Domino, he was so potent for speed that it was commonly said that to get a winner 'breed anything to Domino'. Domino was potent, but in staying lines of Lexington RH (3x4x4) and his sire Boston RH (4x5x5x5), the greatest heat racing stayers of the 1800s. How could building potency in the greatest stamina bloodlines create the strongest speed line? Further, these traits came full blown from our colonial imports of the Irish Hobby into Virginia. And my friend in Ireland, Seamus Davis, informs me that the Irish Hobby was documented in 1399 reports of King Richards invasion in to Ireland, as continually stymieing the invaders because "they used guerrilla warfare here among other things, frequently doing 60 miles a day and producing bursts of sustained speed for attack and retreat. English contemporary accounts state that there was no point in fleeing when attacked--the hobbies would run down any English cavalry horse." So historically, we can see these horses were top sprinters---able to accelerate and sustain it and they all were noted as being of the bulky muscled type, yet they were also able to perform races of extreme stamina and travel great distances without ill effects. Our great American breeder and Senator: John Randolph (1783-1833) stated that our Running Horse was not just blindingly fast, but could win easily in races up to 50 miles! Traditional industry wisdom tends to segregate sprinters into the bulky muscling type and stayers of more rangy form, and sprinters are said to have fast twitch muscle fibers and stayers slow twitch muscle fibers. Yet, history says otherwise. There was a time when both characteristics were common in one breed, and occasionally today we see one of that type appear: Secretariat for example who was said to have perfect 'Quarter Horse' conformation, and as we all know he was invincible at all distances. So, you see, something was 'off' about all this. And I could see that our stamina bloodlines like Lexington RH and Blackburns Whip RH, carried speed and they passed on speed. Faced with this disparity I theorized that perhaps there was more than one speed gene, but recently science has doubled down on saying quite strongly there is only one. It was in discussing this contradiction between science and the historical record on the Bloodlines of the Sport of Kings Facebook page that it finally became clear to me: of course a horse can carry both the speed and the stamina gene, they are not mutually exclusive. And I thank the input and patience of Chad McNamara, Seamus Davis, Jane Bielski and Chantal Spleiss in working out my frustration with this. It became clear that the historical record of the Heroic Era racers and the Hobby ancestor can only be satisfied by possession of both the speed and stamina gene. And somehow in our selective breeding processes we have eliminated one or both from our stock. If we can select the traits out we can surely select them back in. And happily it is not necessary in the Standardbred who is homozygous for both genes still.